Welcome to the world, Faith Emily Lane. 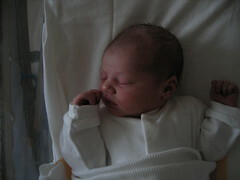 Yup, I am now well and truly out-numbered, and am doomed to live in a house of women. Twitter was down today (typical!) so my twitter followers were spared minute-by-minute updates on the labour. Probably the best for all concerned, actually. Faith is absolutely perfect. She weighed 8lbs (why is that always the first thing people tell you? ), and all the tests so far have showed no problems. I was asked to get a C application working on Windows Mobile. Some colleagues at work have got some hobby code : a bunch of C files which they want to try out on a huge range of mobile platforms such as a slug. On Linux-based platforms, it’s apparently fairly straightforward – without too much work, gcc or some such compiler turns the code into a neat little executable. Now the plan is to try it on a Windows Mobile device. And, probably cos I won’t shut up about Windows Mobile, they asked if I’d fancy giving the code a try on Windows Mobile. 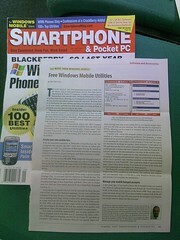 After last year’s blurb in Smartphone & Pocket PC Magazine, I’ve seen another small write-up for my Windows Mobile wiki-based note-taking program, bLADE Wiki. 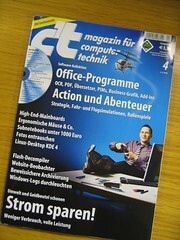 This time, it’s in a German computing magazine called c’t. They’ve included the app on their cover CD, and written a short paragraph describing it. When I wrote the PowerShell snap-in for WebSphere MQ, I chose to implement it as a set of cmdlets. They are new commands for WebSphere MQ – commands that let you get, create, modify new objects representing WebSphere MQ objects. The commands are consistent with existing commands in syntax and style, to be sure. But, they’re still new commands. I didn’t have to do it this way. I wrote last week about an evening I spent throwing together a password manager for Windows and Windows Mobile. As I wrote at the time, one of the motivations was to try writing some encryption code. I’ve finally got around to writing it, and wanted to post it here with a few comments. The System.Security.Cryptography library in .NET makes this fairly straightforward – the class I have written to add crypto support to the password manager app needed only a few hundred lines of code in total. I’ve shared a simplified version of the source at the end of this post. We use a Confluence wiki for one of the projects that I work on. Wikis can be a fantastic tool for collaboration, and this wiki is a single place where we can share information and our progress. But we’ve been having problems with the reliability of the wiki – it is unavailable at times, and can be painfully slow at others. Key information that I need is in that wiki, and when the wiki goes down it can be difficult and frustrating. Yesterday, I had a play with wget to try and download an offline copy of the wiki to use as a backup for when it isn’t working or is going painfully slow. I’ve put the steps I took here, in case they will be useful for others. An article I wrote for the Hursley intranet. 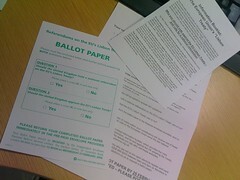 There is nothing confidential in it (and it took me long enough to write!) so I thought it’d be good to share. The first phase of Support U 2 – a pilot mentoring project for young people run between business, charity, and government agency – came to an end with a celebration evening in the Clubhouse. Support U 2 was started to help hard to reach young people – people not in education, employment or training, and identified as being unlikely to change this without some additional effort. IBM’ers are already mentors for young people through programmes like MentorPlace. Youth charity, Solent Youth Action (SYA), work with young people through volunteering placements, activities and youth groups. Government agency Connexions provide advice and counselling to young people. All of this happens already, and makes a massive difference to the lives of thousands of young people. The unique aspect of Support U 2 was how these organisations worked together. The project brought them together to make a focused, coordinated effort to change the lives of young people identified as being at risk of remaining NEET. Rather than offer separate programs, they pooled our resources – IBM’s business expertise, Connexions’ expertise at working with NEET young people, and SYA’s expertise at finding young people engaging, educational placements and activities. This was brought together to produce an intensive, coordinated package, tailored to each young person.